The Catalogue is released without the associated seismic wave arrival times and amplitudes used for this work. These underlying parametric data are available as part of corresponding events in the ISC Bulletin. Several public and commercial sponsors have given the ISC funds to help extending and improving the ISC-GEM Catalogue. The original (Version 1.0) ISC-GEM Catalogue covered the period 1900-2009 with specific magnitude cut-off thresholds. These thresholds were dictated by the need to finish the project in just two years and the size of funding available at the time. Yet quality bulletin data exists for many other smaller yet significant events that would complement the current Catalogue. Judging by the recent numbers of earthquakes with M≥5.5, recorded by modern networks, there is a good chance to considerably improve the contents of the GEM Catalogue in the period 1900-1970 by including events with smaller magnitudes, perhaps all events with M≥ 5.5 included in the printed volumes of the International Seismological Summaries (ISS) prior to 1960 and M≥6¼ prior to 1918 from other sources (Fig. 1). Figure 1. Annual number of earthquakes included in the current ISC-GEM Catalogue (black) and the number of events available in the ISS (grey) – the main original source of data prior to 1964. Red bars represent expected numbers of earthquakes with magnitude ≥ 5.5, 6¼ and 7.5, respectively, based on the rates of seismicity recorded by modern seismic networks today. Why this extension is necessary? Firstly, the Catalogue must be constantly updated with recent events. It would be a serious deficiency, if events such as the M7.1 Darfield (2010) and M6.3 Christchurch (2011) earthquakes in New Zealand and the M9.0 Tohoku (2011) earthquake in Japan were not part of the ISC-GEM Catalogue. Neglecting to update the Instrumental Reference Catalogue would seriously hamper the community efforts of testing and refinement of earthquake forecasting models. Secondly, it is well known that in seismic hazard studies the effect of small to moderate size earthquakes is not negligible. This is especially the case in densely populated and industrialized areas. History shows that several excellent global earthquake catalogues have been discontinued which has limited their usefulness with the time. Below are two recent very well-known examples of damaging earthquakes. If similar events occurred in the first half of the 20th century, then due to uncertainties in magnitude determination they may or may not be part of the ISC-GEM Catalogue. The L 'Aquila earthquake, Italy, occurred on the 6 April 2009 with Mw = 6.3 (GCMT) and caused 308 casualties and severe damage in the Abruzzo region. Another recent earthquake of similar size (Mw = 6.1-6.3) occurred in New Zealand on the 21 February 2011 causing 181 casualties and an evaluated damage of about $15 billion. Figures 2a and 2b show two damaging earthquakes from the past with magnitudes not sufficiently high to be included in the current ISC-GEM Catalogue. Such earthquakes show a significant impact of moderate size earthquakes in continental areas with a high population. This calls for further improvement to the completeness of the homogeneous reference catalogue that is to be extensively used by the hazard and risk community for many years to come. Figure 2a. 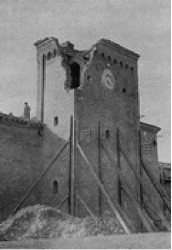 October 30, 1930 earthquake in Central Italy, estimated Mw6.0. Shaking was felt even at large distances and caused collapse and severe damage in Senigallia, Fano, Montemarciano and Ancona in Marche region. Figure 2b. 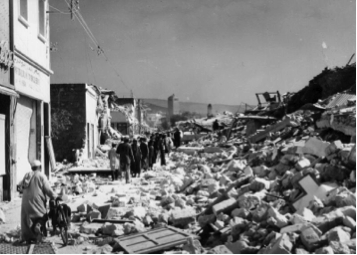 February 29, 1960 earthquake in Agadir, Ms5.7 and Mw6.0. This once-flourishing port and tourist haven in Morocco lost about 40 per cent of its population of 35,000 and property was damaged to the extent of about $70 million. It had been forgotten that a previous town at this location, named Santa Cruz de Aguer, had been destroyed by an earthquake in 1731. Thirdly, it has to be noted that we really have no magnitude estimates for many events in our main source of original data – the ISS bulletin. Some events in the first part of the 20th century could have been large enough to have caused damage. The work of including many more earthquakes recorded at teleseismic distances and bringing previously unavailable station amplitude data from historical station bulletins would greatly contribute to a more accurate analysis of global earthquake hazard and risk. We continue updating the Catalogue for all recent events of magnitude 5.5 and above beyond year 2009. We are also incuding all known events with magnitude 5.5 and above in the period 1918-1960 for which reliable arrival time and amplitude station information is available. We shall also aim to review all known events above magnitude 6¼ during 1900-1917. Figure 3 presents a plan of work during 2013-2017. Figure 3. 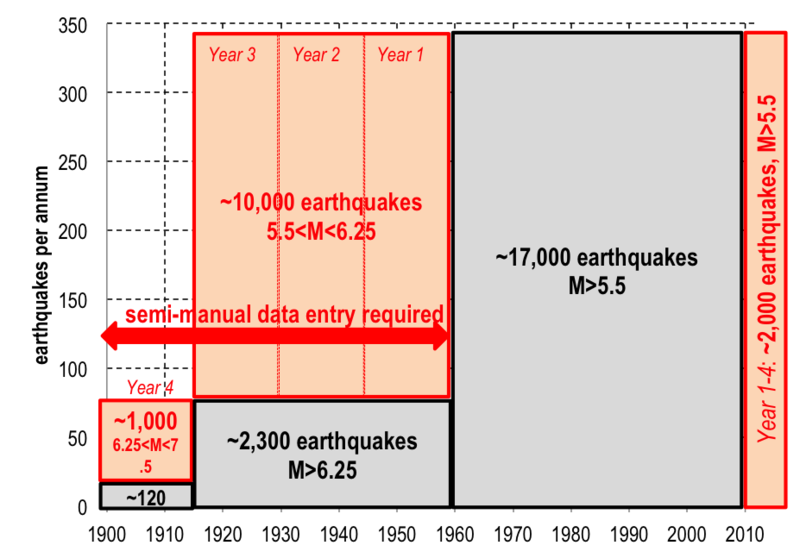 The diagram shows the approximate number of earthquakes for each period of time and magnitude interval in the existing ISC-GEM Catalogue (black) and the number of earthquakes expected to be added to the Catalogue (red) during 2013-2017. Note that a large amount of semi-manual data entry from historical paper-based bulletins would be required for years 1900 till 1959, whereas the original data for years 2010-2013 are/will be already available for further work in electronic format. ✓ the magnitude cut-off in the period 1900-1917 reduced to 6¼. This work is likely to quadruple the current number of earthquakes before 1960. As a result, data for many smaller yet damaging earthquakes of the past will be available for both global and regional analysis of seismic hazard and risk.